I'm ~thankful~ for this heatwave, my last hurrah before venturing into the Asian arctic in a week. That's right, I'm going back to Asia, and for a month! It'll be my first time in Japan and I'm visiting the motherland, Korea, as well. The coming blog/vlog updates are going to be insane. I can't wait to create cool content over there. Anyway, if you want to send me off and wish me well, I'd love if you came to my little shindig at Feral Creature HQ. It is not only a goodbye party for myself, it's also a goodbye party from me to my little workspace. The lease is up and I'm not renewing. I've had such a good year with it; we've been featured in Nylon Japan, Vans, and Refinery 29...twice! Come by for a blowout closet sale (basically everything must go), drinks, dancing, music, and a raffle. The raffle tickets are $1 for a smashing prize package and all proceeds go to my favorite charity, Leave No Paws Behind (take a moment to read their mission statement and donate a buck or two to them, please!). I've attached the flyer below. Can't wait to see you this Saturday! Minkpink The Traveler fringe cardigan. 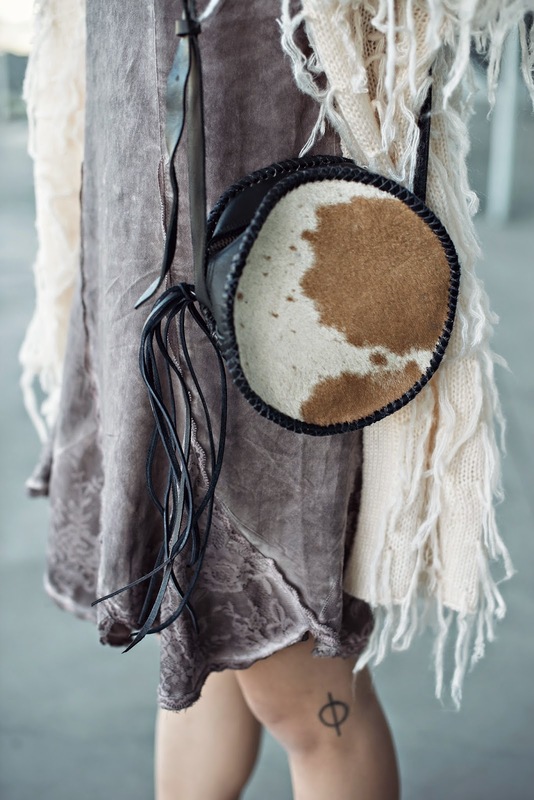 ThreadSence calf hair canteen crossbody. I love the dress. And congratulations on the trip!